Eid-ul-Adha ( Feast of the Sacrifice ) is celebrated by Muslims all over the world to commemorate the willingness of Hazrat Ibrahim ( A. S. ) to obey Allah's ( God's ) command to sacrifice his son Hazrat Ismail ( A. S. ), before Allah intervened and provide Hazrat Ibrahim ( A. S. ) with a ram to sacrifice instead. Now Muslims sacrifice an animal ( usually a goat , sheep , cow or camel ) every year during Eid-ul-Adha to keep fresh the memory of that great sacrifice. The meat from the sacrifice is divided into three equal parts; one third for the family, one third for relatives / friends / neighbours and one third for the poor and needy. While Eid is just around the corner, I thought to invite few bloggers friends to guest post here and share their favorite recipes for Eid-ul-Adha. Today, I'm excited to be featuring a guest post from Lubna of " Yummy Food ". Most of you would be already familiar with her blog which is full of delicious recipes and stunning pictures. When I requested her to do a guest post for my blog with some traditional Eid-ul-Adha recipe, she promptly responded with this yummy recipe. Let's see what she has to share with us! 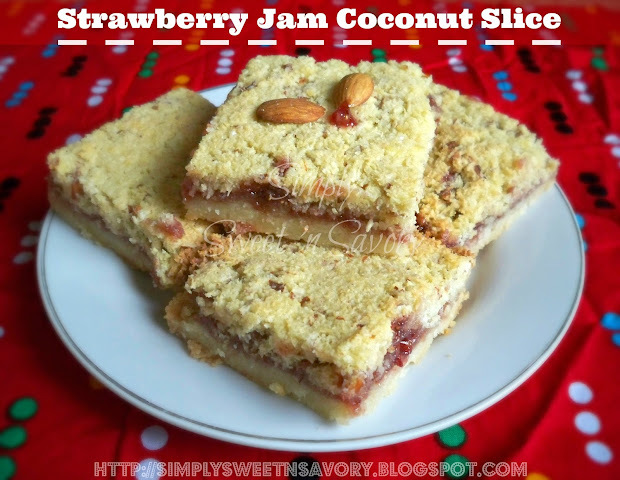 Assalamu alaikum and welcome to the lovely readers of Simply Sweet 'n Savory. It is my immense pleasure to do a guest post for you people. When Ambreen mailed me to write about a traditional meat recipe which I make at home for Eid-ul-Adha / Bakreed / Bakrid ... with no second thought I choose these Shami Kebab recipe ... as this is my favourite recipe and mostly made during this festive time at my aunt’s place. And as I am at aunt’s place this season, I thought of sharing this recipe straight from her kitchen. 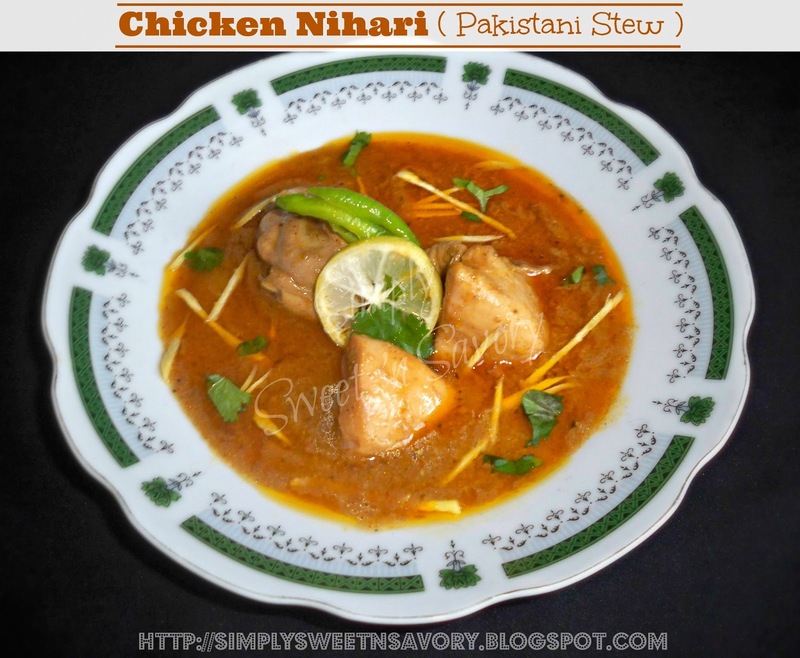 Chicken Nihari ( Pakistani Stew ) ... Nihari is a famous South Asian meat stew, specially popular in Pakistan, India and Bangladesh. This slow-cooked meat dish is usually made with beef or mutton, but it tastes just as delicious with chicken. Pineapple Cookies ... Soft, melt-in-your mouth type cookies, made with pineapple flavoring. 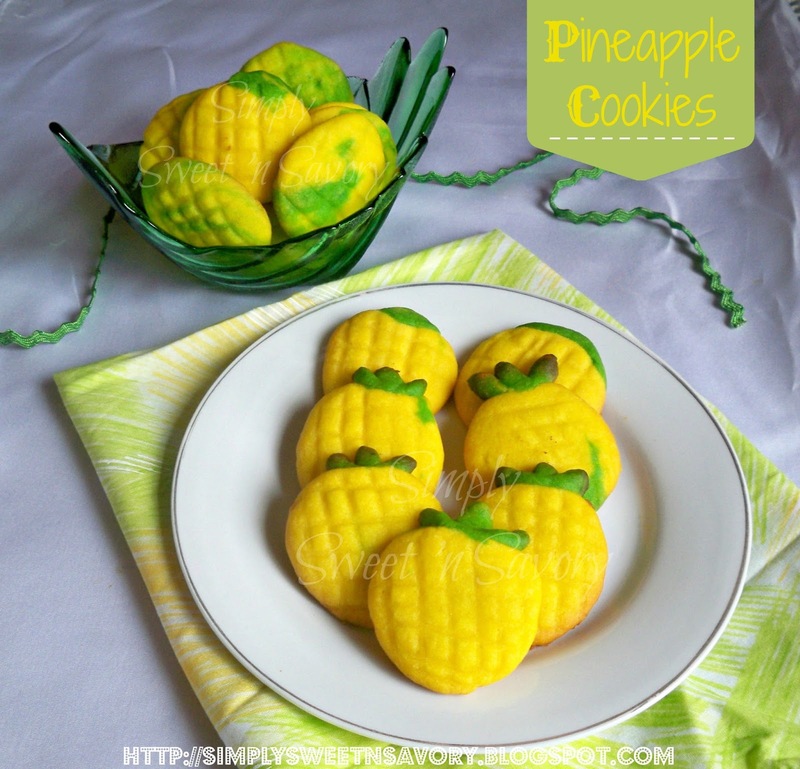 The addition of pineapple essence gives them a refreshing tropical flavor. 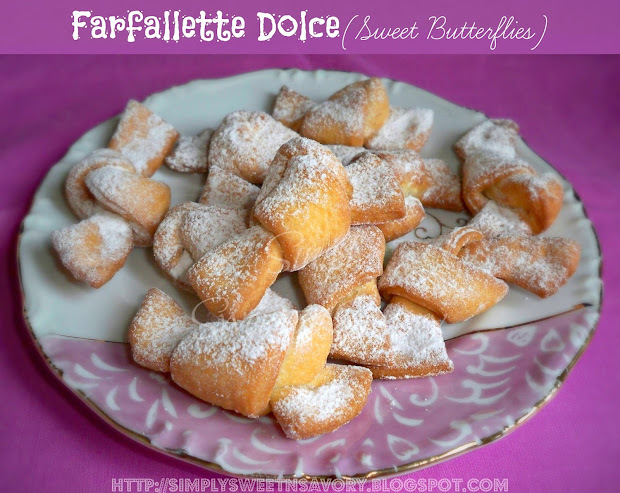 Farfallette Dolce ( Sweet Butterflies ) ... Enjoy a sweet treat from Italy! These fried cookies are formed from strips of sweet dough that are twisted and tied into butterfly shapes, fried in oil and served with a dusting of Icing sugar. Please, join me today guest posting at Razina's space " RaaaZzzfoodlove ". I’m sharing a delicious sweet treat which is perfect for afternoon tea or as a snack. Please, check out my guest post HERE !!! Also linking this to BACK TO AUTUMN - ONLINE LINK PARTY! 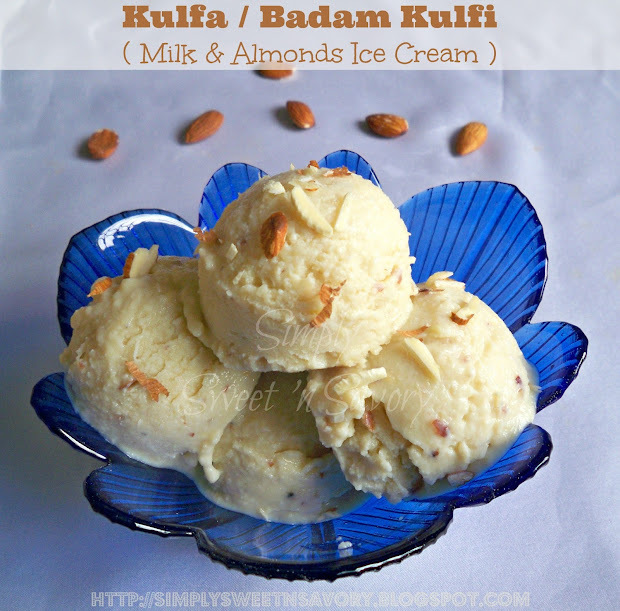 Kulfa / Badam Kulfi ( Milk & Almonds Ice Cream ) ... Kulfi is a traditional Pakistani / Indian ice cream made with milk, khoya, sugar & nuts.